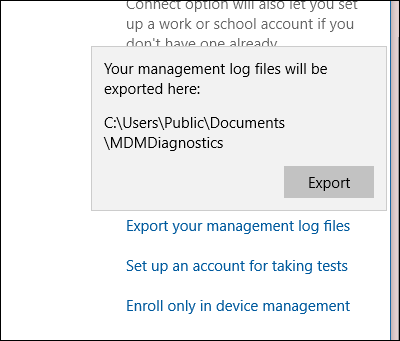 To help diagnose enrollment or device management issues in Windows 10 devices managed by an MDM server, you can examine the MDM logs collected from the desktop or mobile device. The following sections describe the procedures for collecting MDM logs. 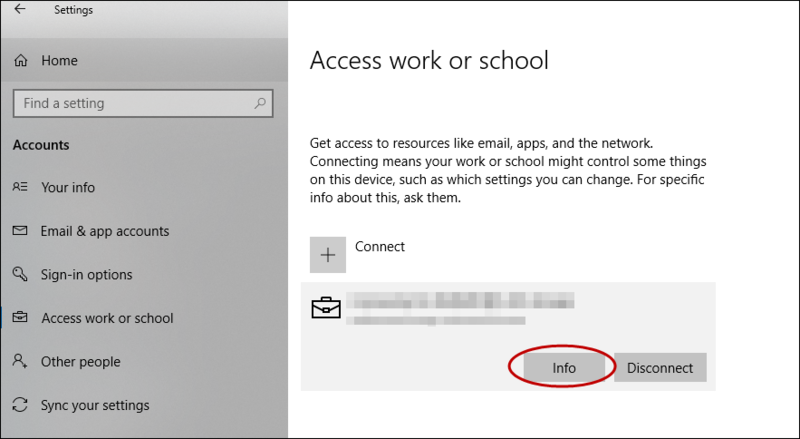 On your managed device go to Settings > Accounts > Access work or school. Click your work or school account, then click Info. 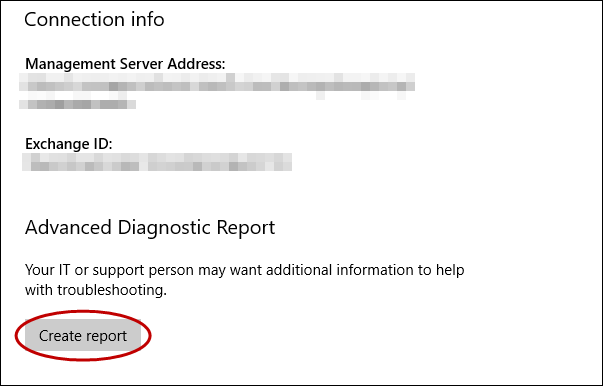 At the bottom of the Settings page, click Create report. A window opens that shows the path to the log files. Click Export. 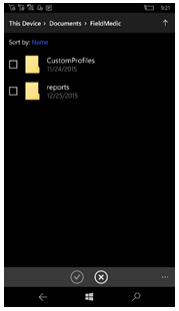 In File Explorer, navigate to c:\Users\Public\Documents\MDMDiagnostics to see the report. In this location, the Admin channel logs events by default. 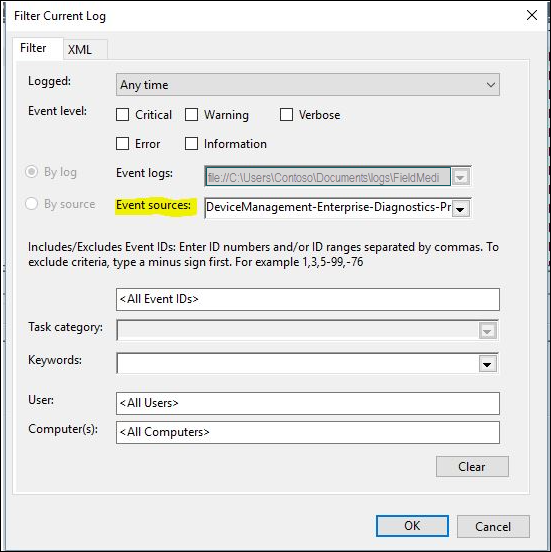 However, if you need more details logs you can enable Debug logs by choosing Show Analytic and Debug logs option in View menu in Event Viewer. Right click on the Admin node. Select Save all events as. Choose a location and enter a filename. Choose Display information for these languages and then select English. For more detailed logging, you can enable Debug logs. Right click on the Debug node and then click Enable Log. Right click on the Debug node. 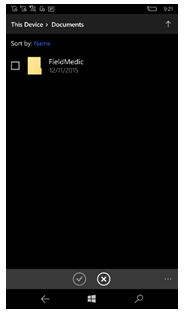 You can open the log files (.evtx files) in the Event Viewer on a Windows 10 PC running the November 2015 update. 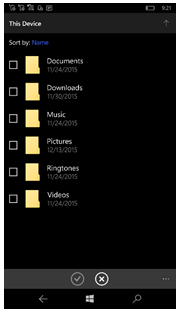 Since there is no Event Viewer in Windows 10 Mobile, you can use the Field Medic app to collect logs. Download and install the Field Medic app from the store. Open the Field Medic app and then click on Advanced. Click on Choose with ETW provider to use. Check Enterprise and un-check the rest. In the app, click on Start Logging and then perform the operation that you want to troubleshoot. When the operation is done, click on Stop Logging. Save the logs. They will be stored in the Field Medic log location on the device. You can send the logs via email by attaching the files from Documents > Field Medic > Reports > ... folder. The following table contains a list of common providers and their corresponding GUIDs. For holographic or mobile devices already enrolled in MDM, you can remotely collect MDM logs through the MDM channel using the DiagnosticLog CSP. After the logs are collected on the device, you can retrieve the files through the MDM channel using the FileDownload portion of the DiagnosticLog CSP. For details, see DiagnosticLog CSP. For best results, ensure that the PC or VM on which you are viewing logs matches the build of the OS from which the logs were collected. Right-click on Event Viewer(Local) and select Open Saved Log. Navigate to the etl file that you got from the device and then open the file. Click Yes when prompted to save it to the new log format. The new view contains traces from the channel. 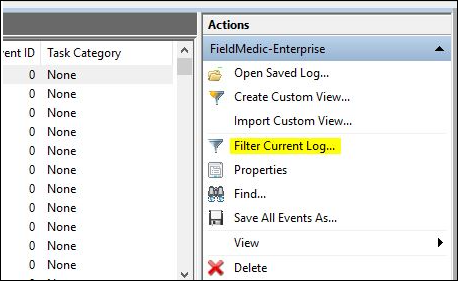 Click on Filter Current Log from the Actions menu. 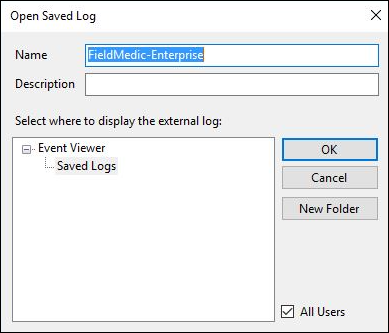 Add a filter to Event sources by selecting DeviceManagement-EnterpriseDiagnostics-Provider and click OK.
Now you are ready to start reviewing the logs. 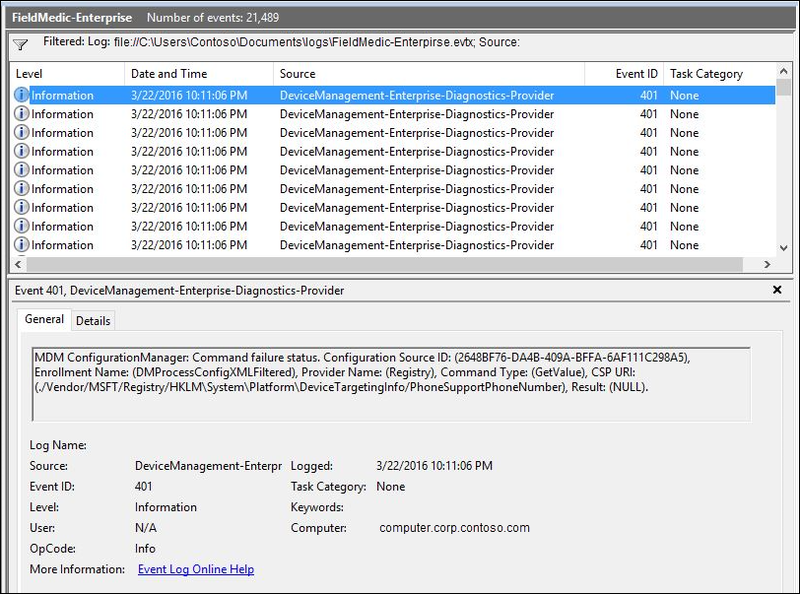 Here's an example of how to collect current MDM device state data using the DiagnosticLog CSP, version 1.3, which was added in Windows 10, version 1607. You can collect the file from the device using the same FileDownload node in the CSP as you do for the etl files.